Well, these Pantheon trinkets sure do make things interesting: Eonar’s Compassion (healer), Aggramar’s Conviction (tank), Golganneth’s Vitality (agility), Khaz’goroth’s Courage (strength), Norgannon’s Prowess (intellect), and Aman’Thul’s Vision (legendary). These trinkets have spurred a lot of questions. As always, we’re here to answer them with lots and lots and lots of data. How many trinkets does our raid need for the Pantheon proc to trigger often enough to care? What if my team has a bad distribution – maybe only healers are getting the trinkets!? Is the regular (role) trinket or the Legendary Aman’Thul’s better for me? Will my raid leader require that I wear it to increase the team’s proc chance? To find out how these trinkets stack up, custom to you, there are 2 things you can do. Mr. Robot ranks it for you on the gear optimizer. There is a filter to set the # of other people who have trinkets in your raid, so it will dynamically adjust the ranking. One note: if your team has 4 or 5 trinkets, but they aren’t 4 unique ones (so they can’t meat the 4-unique condition), then set the filter to 1 so the system doesn’t make it proc. Once you set it high enough to proc, the system gets the proc chance from simulations. It’s easy, promise. In fact, I demonstrate how to do it in this super short pantheon-sim video. Before this goes live, we only have PTR data to base assumptions on. As always, we like to make sure our data and assumptions are transparent. Here’s what we know and think we know. Or as sure as we can currently know! And Blizzard has stated as recently as Oct 16 that things can still change. There are 6 Pantheon trinkets. Five of them cover each type of spec Eonar’s Compassion (healer), Aggramar’s Conviction (tank), Golganneth’s Vitality (agility), Khaz’goroth’s Courage (strength), Norgannon’s Prowess (intellect), and then there is also the legendary, Aman’Thul’s Vision. The legendary version does not count as your 2-equipped-legendaries restriction. You can have 2 legendaries plus this legendary pantheon trinket. You need 4 unique buffs to trigger the Pantheon buff. The legendary ones act as a wild card. That means you can have a healer, a tank, and 2 legendary trinkets count as 4 unique buffs. (source – Blizzard). This logic would make it sound like 2 healer trinkets, 1 tank, and 1 legendary would not be considered 4 unique buffs. This is our interpretation and has not been spelled out by Blizzard. (Note, on the PTR, Blizzard admitted they all act as wild cards, which is for testing purposes and not intended to go live – they intend to have the unique requirement). The personal procs need to overlap, and when 4 unique personal proc types overlap the Pantheon proc triggers. All of those buffs would be active at the same time – they would overlap even though they procced at slightly different times. This would trigger the Pantheon buff. Only the people who triggered the Pantheon buff get it. Other people who have the trinket but didn’t ‘help’ trigger it don’t get the buff. Would be cool to see screenshots of a lot of the testing. 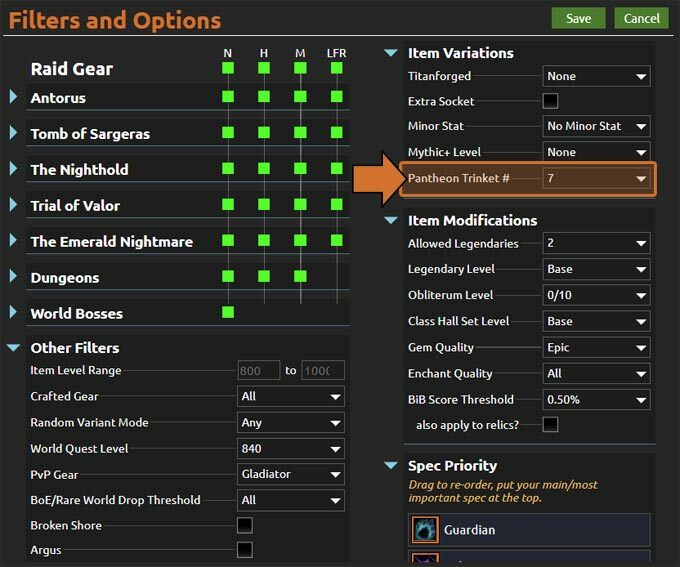 See what gear sets/talents they used while testing each of the trinkets on specs. We did it across multiple builds and gearsets. I also did more tests using top ranked characters and their real gear. And as a last sanity check, I used characters across all skill levels to see if trends changed (they didn’t). The data for legendary vs the role/regular version, by spec, were all over the place. A lot were within 0.25% of eachother, some up to 2% difference, and a small handful greater than that. I haven’t had time to graph that data yet, but hope to do so. It would be easy to just show the best one, given a perfect set of gear, but that has limited usefulness since almost no one gets the perfect set of gear. I like this. Blizzard are experimenting with loot which is always fun for theorycrafters!